For some reason I was wide awake at 3 AM today so I decided to be productive. 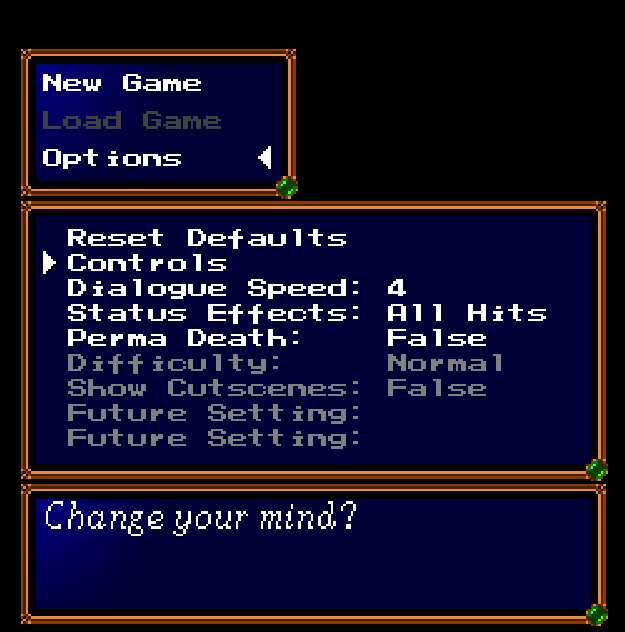 I still have to officially add it to the options menu and fancify it, but it works, and that's the important part. Bones wrote: Sounds like a big project and glad to hear you are continuing on after finishing your course. You seem to have the coding down and probably more in need of artists and musicians but if I can help in anyway please let me know. I don't know what the meaning of the word 'quit' means so... It's getting done at some point lol. I have estimated the first game to be around 20ish battles. Adding in town stuff and exploration I estimate the final game to be around 10-20 hours long depending on your skill and whether or not it's your first time playing through the thing. I did get a nice offer from a composer so I'll probably take him up on his offer and see where it goes. Bones wrote: I actually did blitz the boss and the wolves to the right did attack. If they had more attack I would have been in trouble. Regarding the attack of the wolves, increasing it makes it too difficult for the first battle. Simply because your healer doesn't have enough MP at this point to take care of the extra damage you'd receive. I think instead I'll try making them a tad more aggressive and see if that works. I might as well make 'sprint' while I'm at it. Bones wrote: Controller support on GMS is infinitely better than GM8 but I'm pretty sure you can use a 360 pad with the joystick functions. Probably worth waiting till GMS though cause they are all gamepad functions then so would need to rewrite it anyway. GM8 does not have controller, joystick, ect support. Only mouse and keyboard. So yes, GMS is better in that case lol. Assuming gamepad works the same as the keyboard commands, my game should be able to include gamepad with a small altercation to the control config. Bones wrote: Lol you could teach alot of the big gaming companies a thing or two about no bugs. It was good to see and I like that you had error trapping to give you information in case you do get them. Kira looks awesome and is that dual wielding? Bigger companies also have bigger games with way more code than I have so bugs are understandable lol. But yeah, my college advisor will always try to break our code in every way possible when he grades our projects so at this point it's habit to add comments and error handling. Kira will most likely dual wield post promotion unless the balance ends up being really bad. An idea I had for the balancing would be to have 2 types of weapons. Daggers would be dual wielded, a melee weapon, and give slightly better attack rating while a throwing knife would be main hand only and a weaker ranged weapon. Of course I could also simply double the attack of the daggers and not make them dual wieldable for the same effect but eh dual wielding looks cooler. Made the wolves all out sprint towards your group if you blitz the boss for the hell of it. It looks freaking hilarious seeing wolves bombard you from every direction lol. I also upped attack and defense of the wolves slightly. Currently playing around with it to see how well it works. The battle is now properly scaled. It should be more challenging now. I'll update the download once I finish adding the control config. Here's the 1.1 update to the Alpha Demo. It balances the first battle a bit (it's definitely harder) and it also adds control configuration! Edit: Finally working on item use. I'm most likely going to build in the ability to add an "item use" animation for characters as well just in case someone finds it useful. Now, as far as I'm aware there are only 2 types of items in SF, ones that mimic spell effects, and ones that boost your character's stats. Am I missing any? Or does anyone have any other ideas for item effects? I tested it and loved it. Found no bugs, but it has only 1 battle? you keep saying first battle, so i though there is more than one. Very handy function and worked great for me without any bugs. I was wondering how you were going to save them though. I was going to create another ds_grid and store them and save then read them on the load. I use a laptop too and not all of them have all the keys so being able to remap keys is really handy. I thought maybe if you add spacebar as a confirm for remapping too would be good. Only my opinion though and I'm sure a lot of others would say that's not necessary and it probably isn't. Did you lower Jason's defence or wolves extra attack? Maybe because Max was doing all the levelling up but he was taking 3 damage this time which was good and made me hold back until I got to the boss. The boss rushed me and I took him out with an attack from each character. I did really like the changes and the wolves rushing is probably what wolves would do. Sorry but wasn't sure what you meant by sprint. Sorry I thought you were on 8.1, GMS gamepad functions are similar except the sticks but it's all straight forward. I like the dual wielding. Definitely adds an interesting layer to it all. Would she need two daggers in her inventory and equipped? Then with a ring she would only have one item which would also add balance to the extra attack. As far as I know it's just stats and spells on the items. The only other idea's I could think of would be summoning characters (more for enemies) and spells / items that push back characters on the map. Or a teleport spell. Not sure if they really fit in with SF though. In SF3 the rods you bought gave you an extra spell so all the characters only had 3 default spells. Then say you equipped a Bronze Rod it would give them Detox as an addition spell. Always took up the bottom spell icon. Yeah for now it's just one battle. Technically the second battle has been done for months, however the cutscene stuff that comes before that battle is not done yet, so I left it out for now. I'll probably add a small 'you finished the demo' cutscene to the end of the next one to avoid confusion lol. I have a few global variables that store the Ascii code of the key itself. When you overwrite a button, it looks something like this. global.UpButton = keyboard_lastkey; And to display it on screen in a way that the average player can understand, (otherwise it would show you the Ascii number) I have a huge switch case script that just returns the name of the control when given the Ascii. case vk_up: name="Up Arrow"; To store everything so that controls and game saves persist when you close the game, I'll be using .ini files. I gave the wolves extra attack and I changed their AI slightly. I use sprinting and rushing as the same thing, sorry for the confusion lol. Regarding dual wielding, yes both would have to be equipped, meaning she'd lose out on rings. Either way, I'll have to add a check to see if a character is holding a 2h weapon (like a huge battle axe) and remove the offhand if one is equipped. I'm not dead, just job hunting and all that. I ported the engine to the newer version of GameMaker today and for the most part, there's only 1 major issue that I haven't solved yet in terms of playability and that is the move / attack range functions. Apparently GM changed maps to use hash rather than a list in the newer versions which breaks the function. Other than that, there's only a few minor visual issues. Also, I fixed a small bug with spacebar spam on the title screen of the game. The game starts to look really good. I was skeptical about the combat at first, but it looks very nice in the most recent footage. Really love that sword dancer attack. Rya.Reisender wrote: The game starts to look really good. I was skeptical about the combat at first, but it looks very nice in the most recent footage. That's understandable since AI and battle cutscenes is unfortunately where most fan games fall apart. I knew a bunch of people would be skeptical at first so I only started this thread after I had them somewhat working lol. I think everyone here on SFC would agree with you there. We do need more Shining style games lol. Long term, the story I have written for LoS will definitely be a few games long. You can now use items in battle! The next step is to clean up the battle cutscene code a bit, fix timing issues, and simplify the creation of item / spell effects since that part is still rather tedious and much of the code can be re-used. I also built in "Item Use" and "End Item Use" animations. This way if anyone wants to create a different character animation for using items, they can do so. Otherwise it just plays the normal "Attack" animation. Magic and Item Use are now optimized. I still have to add item consumption and degrading to the script, but that's a simple flag. Both Items and Magic are set up to allow for the targeting of both enemies and allies, so if someone fumbles a grenade, or if atlas decides to perform friendly fire, the game wont break. In all 3 cases (Attack, Magic, Item Use) you can overwrite the default script (or part of it) in case anything works differently than the default script. So basically, adding random things like throwing your sword at the enemy is now possible. As I mentioned before, I really hate working with menus. It's a lot of counting pixels and trying to get stuff to line up properly. So much so that I've probably loaded and reloaded the game thousands of times by now, changing a few numbers only to find that the alignment is still off. Nonetheless, items can now be used in town. If an item doesn't have an effect it defaults to the 'but nothing happens' message. If it has an effect, it will fire that script. The cool part is, items can share effects (thus re-using code) and these effects are independent of the actual engine to make for easy sharing later on. Oh and we now have working 'power potions' as well. Chaos you are my hero right now. This looks fantastic. Caedmonball19 wrote: Chaos you are my hero right now. This looks fantastic. Anyways, I finally got the 'items' portion of the town menu working. Also, I was never stupid enough to try to give an item to myself before. I opened up SF2 to see what would happen and it turns out you can organize your inventory. Who knew! I recorded an "everything I've done so far" video this morning for those who are just stopping by or for anyone who hasn't played any of the demos. Then immediately after, I added status effects which already outdates the video lol. Nonetheless, we now have status effects, though I still need to do some cleanup work on it as well as add the rest of the effects. The "ring of renewal" restores 2 MP per turn when equipped. Also, if the effect does not happen (like if you already have full MP) the message isn't displayed to save on playtime. You are on a roll my friend! This is looking fantastic. Thanks for creating the video. Oh this is a fun one. Originally this battle wasn't going to be anything special, but I had way too much fun playing around with it so... here you go. The battle should be a nice challenge to most veteran SF players. Death or Egress can be used to XP grind, but it can be done without doing so. Good Luck, Have fun. As always, if you run into a bug or the game explodes, hit F5 and send me the save file! This battle is mainly to test out the new additions of the laser eye and hidden units. Your healer now has blaze 2 and a ring of renewal (restores 2 MP per turn) in order to balance out the battle. The battle itself can be pretty challenging so... Good Luck! +New Demo Battle! "Good Luck" Medium Difficulty. +Modular, can have multiple per battle. +More camera pan scenarios supported during battle cutscenes. -Fixed Magic EXP gains not working properly when capped. -Fixed slight rotation with battle cutscene sprites. -Fixed a bunch of other stuff no one will notice. -Fixed a bunch of stuff I forgot about. Probably a bunch of small stuff I forgot about. Let me know if I missed anything lol. Overall this project is so close to having every single SF feature implemented. Even looking at this list, I can honestly say that the hardest thing left to implement will be status effects (possibly shops too), and they really aren't that bad. Looking forward to wrapping up these last few features soon! Alrighty, this is more a 'developer friendly' update as opposed to a 'new feature' update. The following variables have been added to the 'get stat total' function which means that items, weapons, and the character's base stat have access to these variables and are added together. For example, Attack = (character's attack + weapon + ring). -Fixed a bug with battle cutscenes and AOE. In the case of an AoE, only the initial target can counter. hey looks like the game is doing well. always glad to see progress. Hey Bum, welcome back to the thread. It always feels good to make progress lol. Alright so I got status effects working in 2 different ways. Effects being applied are NOT dependent on crit. Chance and resistance are determined in the same way as above. Another side note, Status Effects are super easy to add. So basically, adding burn, muddle, boost, stun, sleep, ect will only take a matter of minutes. I also recorded some new videos which I'll post when I get them rendered. -Fixed Egress not properly saving stats. Currently working on battle 2 and the next few cutscenes. + 3 new characters (Kira the Thief, Karina the Mage, and Phillip the Knight). + Battle Backgrounds change based on battle and tile. - Rebalanced Battle 1 EXP gains. -Fixed an issue with Menu Font. -Fixed Camera Pan issue with Cutscene #3. Cool! I cant wait for another demo! If anyone hasn't played the latest demo (Version 1.3.1) here's the link. Anyways, I just started to tackle one of the two big things for the next update. Variable weapon sprites for the battle cutscenes. So far, Melee weapons are working and Jason is fully rigged up for the system. The next task is to polish it a bit more, add the other weapons, and rig up the other 5 characters. I also added a few minor things as well. +Looted chests now display as 'Opened'. +Cancel button can be used to automatically say 'No' to the yes/no menu. +Z button will increase dialogue speed AND automatically advance it when held down. Overall the plan for the next update is to add a bunch of small stuff, weapon sprite animations, and the church / advisor menus (so you can finally save the game lol). Melee weapons are fully implemented and polished. Just as a "what would happen if..." test, I forced a wooden staff onto Jason's equipped slot and it looked hilarious. Swordsmen shouldn't really use staves Nonetheless, if for some reason you needed to tweak things further, I added a 'fine tuning' option for each weapon / character combo. You shouldn't ever have to use it, but it's there if you need it. I finally started on the church menu. Raise is 99% done. All that's left is to add the "not enough gold" scenario. I also created an animation for freeze level 1 and 2. 'Not enough gold' scenario added to raise. Cure is done as well and will test for both poison and curses. I also made it modular so that should more ailments be added at a later time, you could easily copy paste without too much trouble. Promotion took a little longer than expected but it's completed now. You can promote characters who are level X or higher as standard for SF as well as promote characters to a special class if they have a certain item in their inventory. Due to popular request, I added some other features you might enjoy. You can have multiple promotions such as Warrior -> Gladiator -> Warlord. Special promotions can also take into consideration # of kills / defeats, stats, story state, whether they are poisoned / cursed, or any other global variables. Essentially, you now have more creative possibilities should you wish to go down that rout. Save and Load functions are done and appear to be working. I'll be tying them into the church and main menu shortly. For now, I decided to optimize the main menu a bit and add some new gameplay options. Dialogue speed and Status effect mode were both added a while back, but never accessible. Perma-Death was also added. If you try to raise your characters when perma-death is enabled, the priest will say "Sorry, but even I cannot resurrect the dead." Control config was also updated so you can no longer set 2 controls to the same button. Difficulty and 'skip battle cutscenes' have also been added as placeholders for later on. Started working on the Advisor menu which will contain 'Talk', 'Join', 'Leave', and 'Help' functions. Talk allows you to have a friendly chat with your advisor (based on story state), join and leave are your basic add / remove people from the battle party functions, and help brings up the church menu. So far, 'help' is done and 'leave' is almost done. I finally got the tedious Advisor Menu done. The 4 options are Talk, Join, Leave, and Help. Join: Add force members to your active battle party. Leave: Remove people from your active battle party. I also added a global "Max battle party size" variable. By default it's set to 12. Karina's portrait has also been updated. -Add ranged weapons (and exploding arrows) to battle cutscenes. -Polish existing dialogue / cutscenes. This looks amazing, just posting so you don't have to keep editing your old post also. Wow i'm actually so impressed I have very high hopes for this especially having programmed video games since third grade and this had always been one of my unrealized goals too. Now I'm almost graduated university.